I love some special Indian food combo to the core. That food with natural vibrant color and luscious texture will always hunt me to be savored. As a blogger, it is very rare to cook the same recipe often. But some special dishes will be demanded by my kids several times for weekend dinner meals and lunch meals. And this recipe is the one which falls into that group. A traditional Indian recipe with panner and coconut milk. 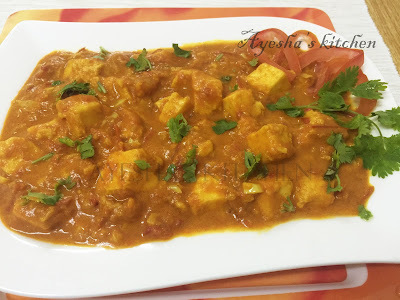 For those who love simple and tasty paneer recipes, here it is. It is a less time-consuming recipe when compared to paneer tikka masala, paneer makhani and other paneer recipes. 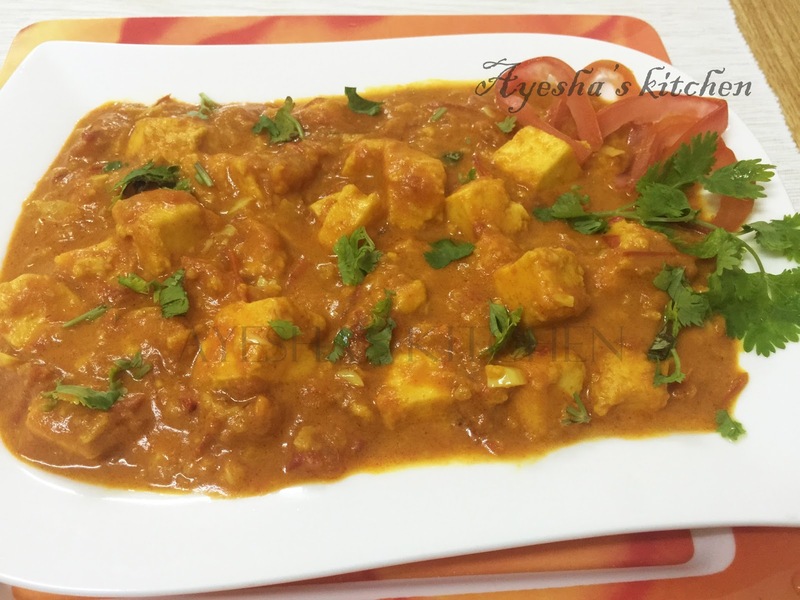 So try out this paneer recipe and serve it along with Indian bread or rice. It is yummy. Slice the paneer/ cottage cheese into small pieces or cubes. If you are using market bought paneer, then soak it in hot salted water for 1 minute. This makes them soft. Heat some oil in a pan and add the sliced tomatoes. When done add green chilies, ginger garlic paste, turmeric powder, Kashmiri chilly powder, salt and mix well. After few minutes add thick coconut milk and mix well. Cook for a while and then add the paneer pieces to it and again mix well. Now cook for 5 minutes ( do not overcook paneer). Pressure cook chopped onion, tomato, green chiles, ginger garlic paste, turmeric powder, coriander powder, pepper powder, garam masala powder, chickpeas and salt for 4 whistles. Add enough water too. Again bring to boil with the lid open. (this helps to get a thick consistency). Heat a pan and splutter mustard seeds and fry curry leaves. Splutter mustard seed and then add chopped beans to it. Cook for few minutes and put required salt too. When beans is half done add cabbage along with turmeric powder. Now crush coconut, green chili, and a small onion in a mixer. Then add this coconut mixture to it and mix well. Cook until the raw smell of coconut goes off. Finally, add curry leaves and serve. Though squid or calamari is not available like any other fishes, this fish has a great place in seafood party dinner ideas. 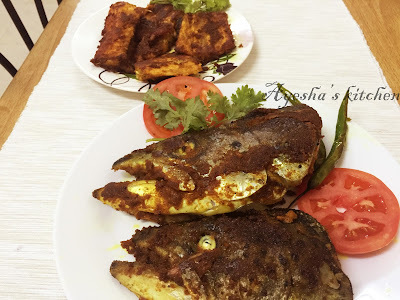 As I am from Kerala, I love to cook seafood recipes often for lunch. 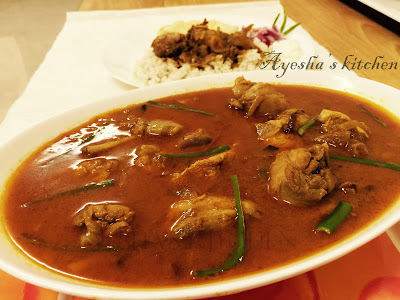 Fish fry or fish curry for the lunch is very common in most of the households in Kerala. Indian fish recipes are always unique in taste and flavor but will be spicy. For this fried calamari recipe, I marinated the squid rings with all the ingredients which crushed gently with hands and then added to the hot oil, fried in a medium heat until done. You can add or less the chili powder according to your spice level. 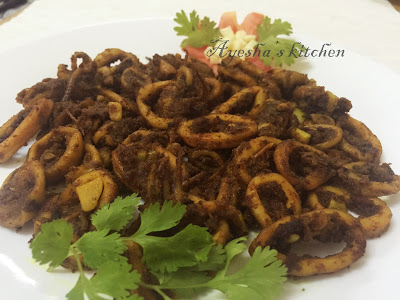 So do try this recipe for squid fry and drop your comments. Clean the squid and cut into round thin shapes and keep it aside. Heat a pan and pour some coconut oil. When hot add the marinated squid to it and stir occasionally. When the squid and the gravy come to the required consistency, then remove from flame. 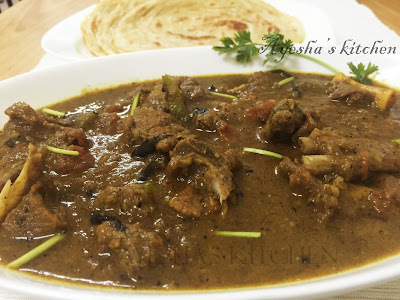 Mutton curry/goat curry with authentic Kerala spices is a flavorful and inviting mutton recipe that pairs best with steamed rice, chapati, appam or ghee rice. 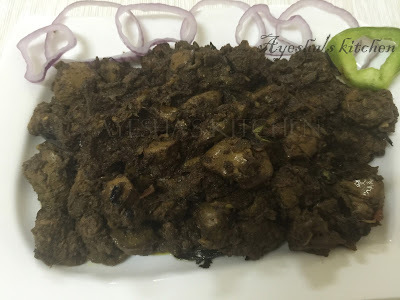 Some recipe for mutton especially Kerala recipes are full of flavors with an authentic taste. Yummy recipes can change our mood within no time and this easy recipe with mutton can make your dinner meal or lunch meal more delectable. Try this easy, spicy Kerala mutton curry that can be made in a flash of time. 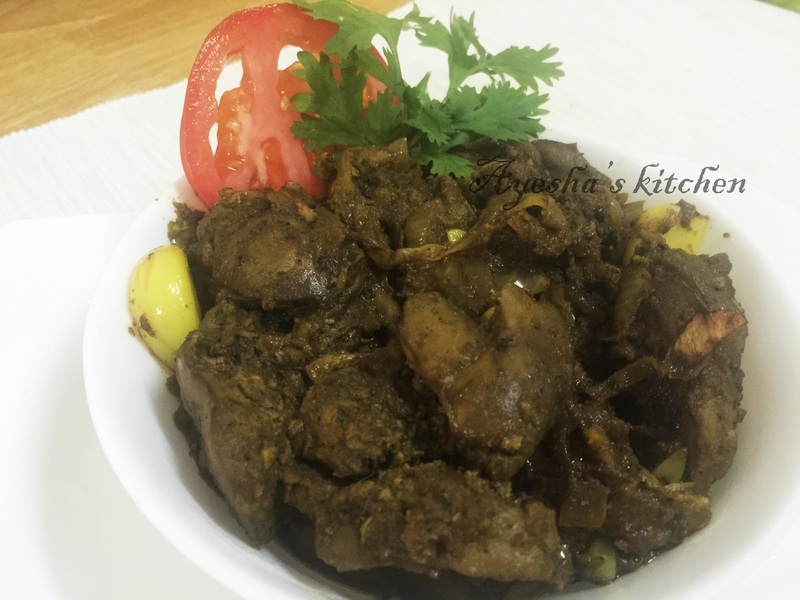 Here is the recipe showing how to make curry goat /Kerala mutton curry / yummy easy dinners. Heat coconut oil in a cooker and when hot, add sliced onion to it. Saute for a while and add green chilies, crushed ginger garlic and perum jeerakam powder (fennel seed powder) to it. Again saute for few minutes and then add sliced tomato. Close the lid for a while and now add the cleaned mutton to it. Now add turmeric powder, coriander powder, chilly powder, pepper powder, and salt. After 4 whistles switch off the flame, let it stay for few minutes. Then open the lid and cook for some more minutes to make the curry thick. Heat oil in a frying pan and saute few sliced small onions(shallots) and when done put some curry leaves and coriander leaves. 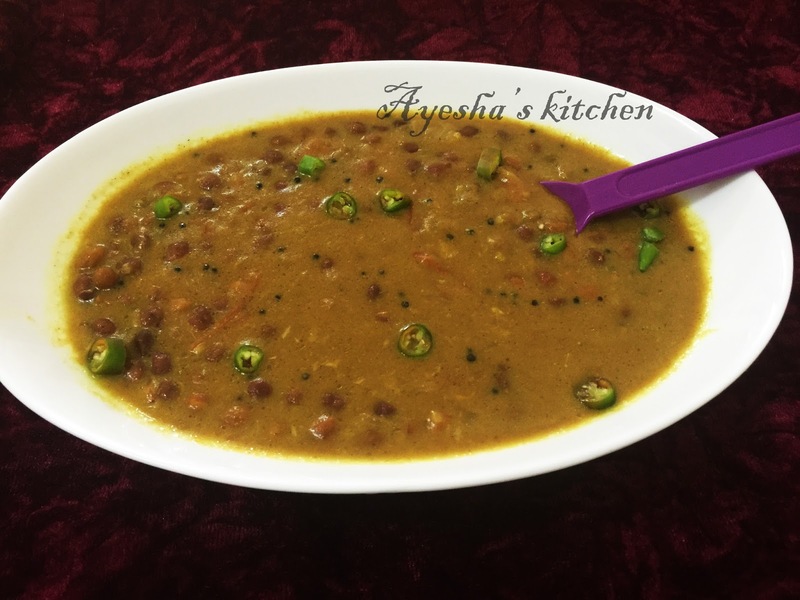 Serve hot with ghee rice, chapati or dosa. Yet another chutney recipe added to my blog album. Spicy garlic chutney is one of the most aromatic flavor chutney in which the ingredient garlic predominate the taste of the entire side dish. A very delicious South Indian accompaniment along with idli and dosa. 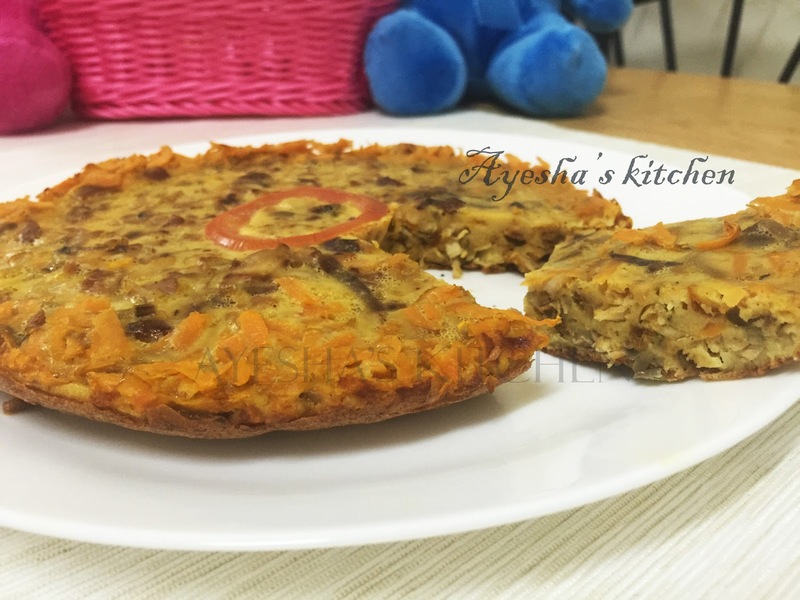 Every morning we will be struck up with the breakfast ideas.What to make for breakfast?. As breakfast is our first meal of a day, it has a great influence on our body the entire day. It can make up or break up our day. But most of us eat anything that comes in our hand and hurries to our work even though we are served with different types of breakfast. Isn't it? For me, breakfast recipes are something very hard to make. But I love to make South Indian dosa/idli which can light up your boring morning. 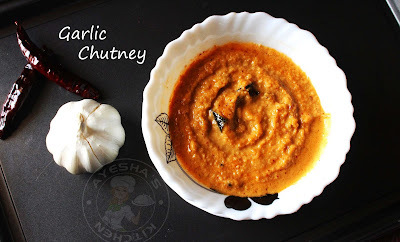 If we have some aromatic flavorful chutney recipes to make as an accompaniment, will surely make an impeccable morning meal. 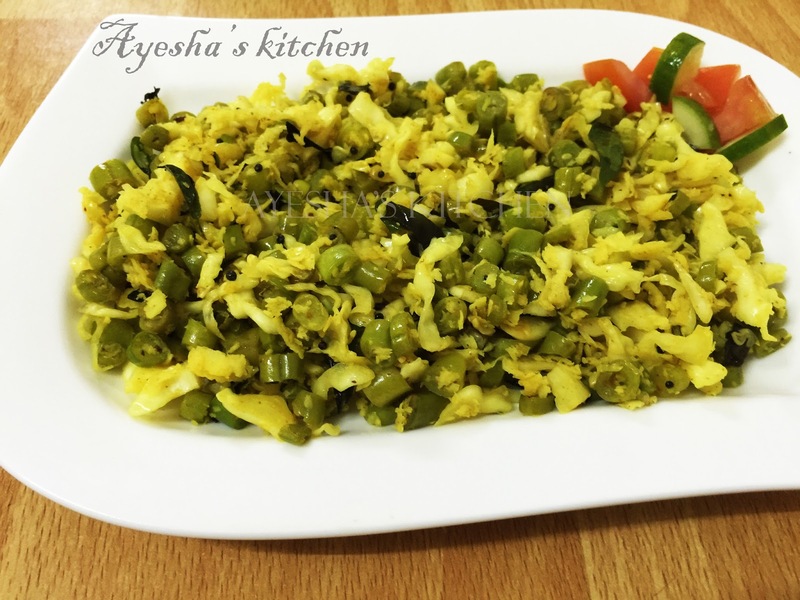 So let's see how to make a healthy breakfast side dishes which pairs best with south Indian breakfast recipes. 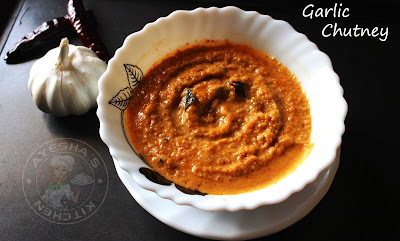 Here is the recipe showing how to make hot aromatic flavorful garlic chutney at home. Heat 1 tsp of oil in a pan and fry dried red chilies for 2 minutes over a medium flame. Keep it aside. Next, fry thin roundly sliced garlic until slightly golden. Keep it aside. 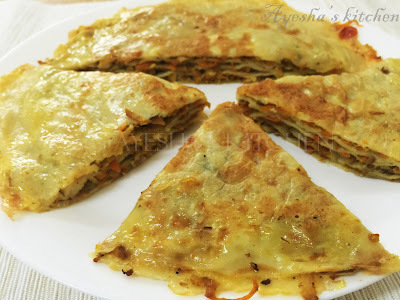 Enjoy with Idli, Dosa, or Thattil kutti dosa. Heat the ghee and saute a small onion and add 2 cups of water. When it starts boiling, add required salt. And now make the flame to low and mix in the flour slowly stirring continuously. Now add the gingelly and mix well. Once cooled, start kneading by adding the egg and make a smooth dough. Make small balls and press each balls gently to make button shapes. Heat oil in a round-bottomed vessel and deep fry it. I am here with a lovely dessert which is easy and quick to prepare. Indian desserts are considered as an important part of any celebration or auspicious occasions. How about a bowl of vermicelli (semiya) cooked in milk and sweetened with sugar or condensed milk and then flavored with nuts or dry fruits? A yummy treat to our taste buds. This vermicelli recipe is named as payasam/kheer / payesh / payasa, based on some regional varieties. kheer is a type of pudding from the cuisine of Indian (Indian recipes). Kheer recipe can be made with rice, broken wheat, vermicelli, semolina or fruits along with milk and sugar. Cardamom, saffron, raisins, and nuts are also added for additional flavoring. 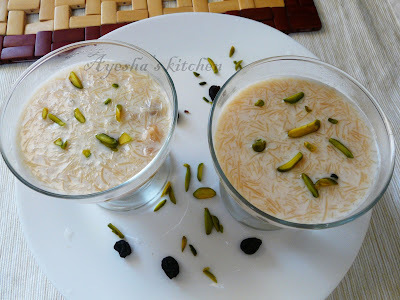 So let's see how to make easy kheer recipe with vermicelli / semiya payasam /vermicelli pudding. Heat 1 tbsp of ghee in a deep bottomed heavy pan and roast the vermicelli till golden in a low flame. Then add half of the milk to this along with crushed cardamom and boil it until the vermicelli is 90% done over a low flame. When vermicelli is done, add the remaining milk and boil for 2 minutes. Then add milkmaid and sugar. Mix well until well combined. When done, remove from the flame. Now heat 2 tbsp ghee in a saucepan and fry cashews and raisins. Pour it to the prepared kheer or payasam. (HALF CUP) INSTEAD OF CONDENSED MILK.